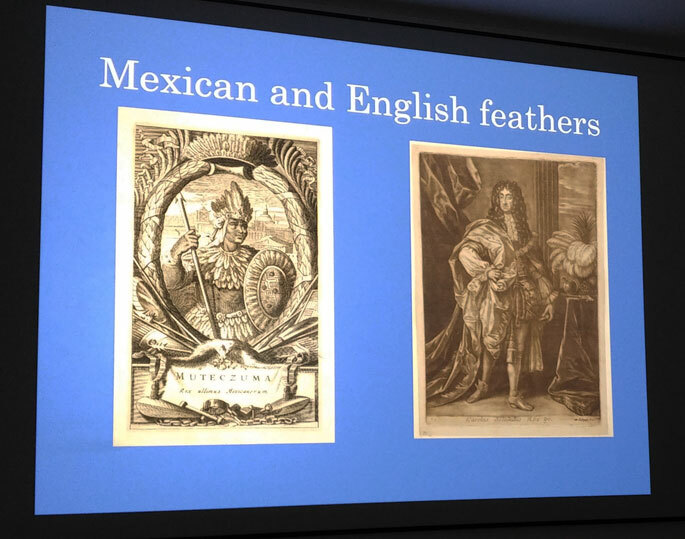 The symposium provided an opportunity not just to hear news of the major research and restoration project conducted in recent years by scientific teams from Mexico and Austria on the famous Aztec feather headdress now back - after eight years! - on display in the Weltmuseum Wien (Vienna’s Museum of Ethnology), but also to hear wide-ranging talks on Ancient Mexican Featherwork (Baquedano), Featherwork in the Codex Kingsborough (Codex Tepetlaoztoc) (Lesbre), Mexican Feathers in the English Restoration Stage and French Pageantry (González-Treviño). 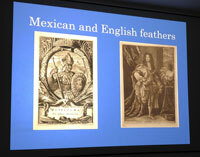 The symposium concluded with a showing of the documentary film El Penacho de Moctezuma with accompanying presentation (Moreno). 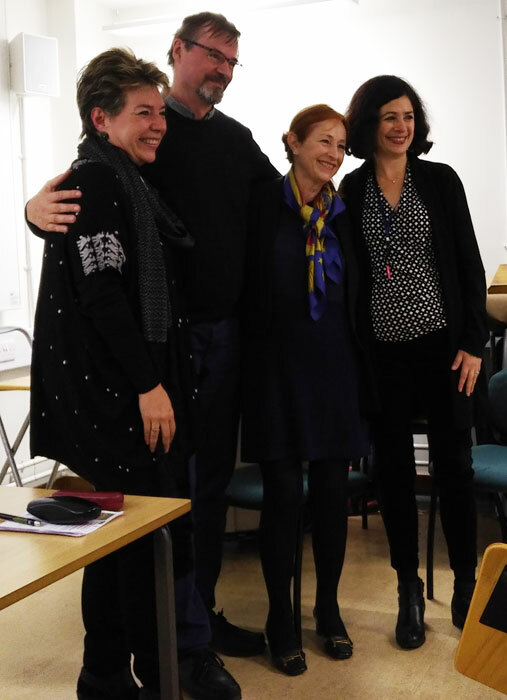 The event itself was a collaboration between UCL and the UK branch of Mexico’s National Autonomous University (UNAM-UK), embracing art, archaeology and conservation. If there was a common thread running through the symposium, it might well be the extraordinary, almost divine power and symbolic value embodied in precious feathers in ancient Mesoamerica: in the words of Alfredo López Austin, such feathers constituted a special ‘language’ of their own, redolent of authority and pre-eminence, of shimmering, brilliant beauty and preciousness. The ‘Rolls Royce’ of these of course came from the Resplendent Quetzal - the male (and not all males at that) only grows 2-4 of the longest and most spectacular and prized feathers, each taking a full year to grow, only then to moult and for the cycle to begin again. Experts confirmed that the feathers are NOT removed from the bird before time by human hand since they still retain organic material which can lead to the feathers deteriorating. Clearly there was no need to capture the bird at all, let alone kill it - you just wait for the right time of year and then seek out fallen quetzal feathers in the cloud forest. 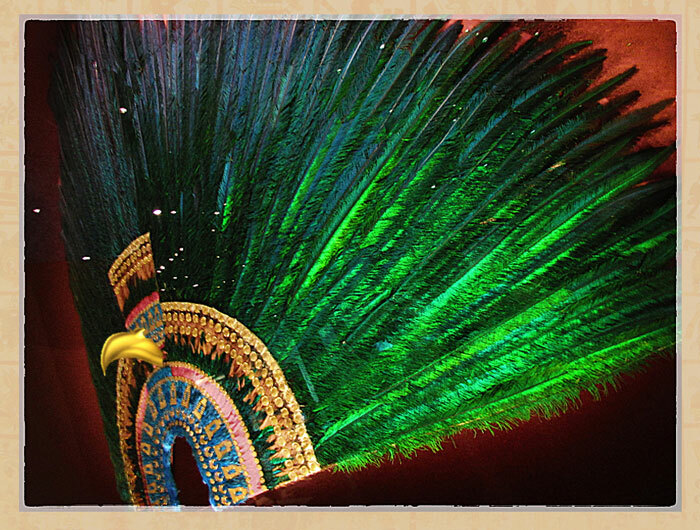 Intriguingly, the élite status of special feathers was recognised not just in Mesoamerica but also in Europe at the time: in Restoration England, such exotic imported objects - outlandish signs of (eastern and ‘Indian’) ‘otherness’ - were akin to precious jewels, indicative of the highest station of the royal crown, of dignity, authority and majestic power. 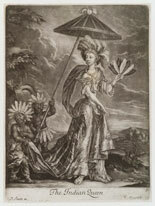 Headdress and crown, in González-Treviño’s words, ‘shared a common symbolic dimension’. Inspired by fashion-leading costume designers in Restoration theatres, and by newly-arrived dramatic and tragic stories of martyred New World rulers - personifications of Nature, Innocence and the Noble Savage - rare, novel and flamboyant ‘Indian’ feathers came to replace ostrich feathers as the ultimate must-have accessories for monarchs and their courts. Actors - and actresses - in heroic ‘Indian plays’ such as John Dryden’s hugely successful The Indian Queen (1664) and sequel The Indian Emperor (1665) wore and carried extravagant props such as exotic bouquets and feather headdresses (pic 3). 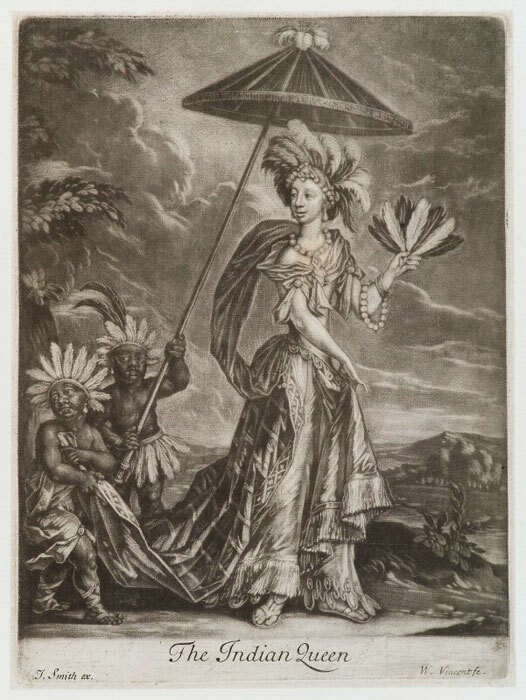 In keeping with the appeal of - yet ignorance about - exotic and extravagant ‘eastern’ luxury accessories, the first reference to the famous ‘Moctezuma’s Headdress’ is from 1596, when it was catalogued as a ‘moorish [ie, exotic] hat’. Since then it has been variously labelled ‘hat’, ‘apron’ ‘cape’ and ‘fan-shaped banner’ or standard. • only weighs 980 gms. 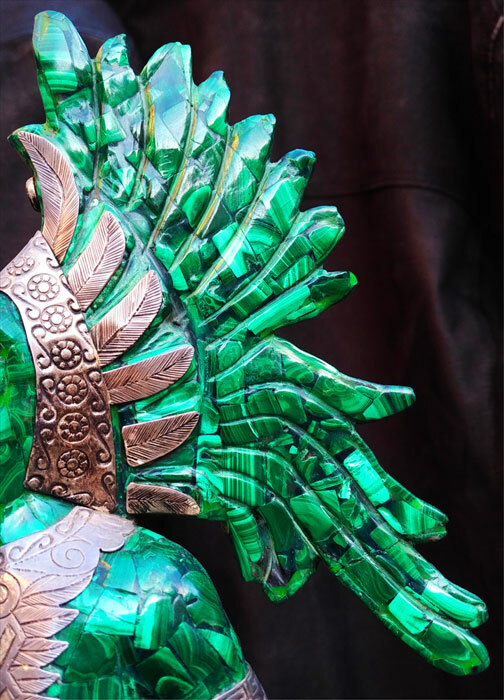 • In the recent restoration, it was found that the original foldable frame had 29 fractures, 98 metallic pieces were loose, and over 100 feathers were damaged. • The Mexica artisans even placed tiny red dots onto the frame to mark exactly where to cut and sew. 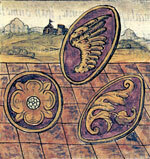 • The damage suffered over the years by the piece came not from weaknesses in its original manufacture but from the stealing of gold buttons and from insect damage following some three centuries in storage. 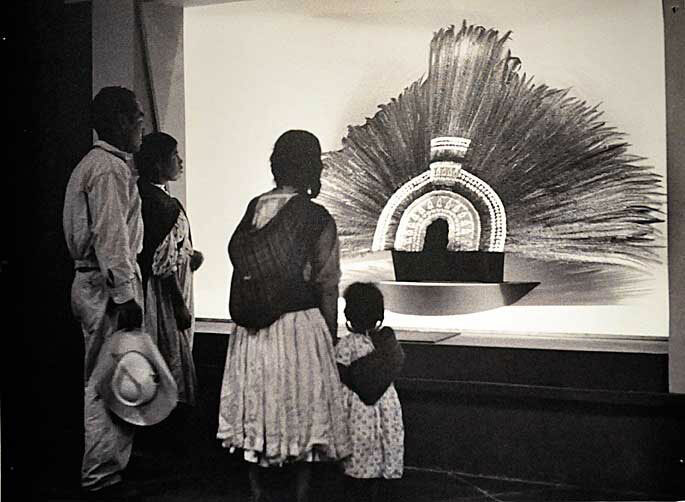 As for the campaign to have the headdress returned to Mexico, even the Mexican researchers have agreed that 10 hours of vibration in an aircraft, however well mounted/protected, would effectively do the same damage as 500 years of neglect! The technology doesn’t currently exist to protect the artefact from such serious vibration. 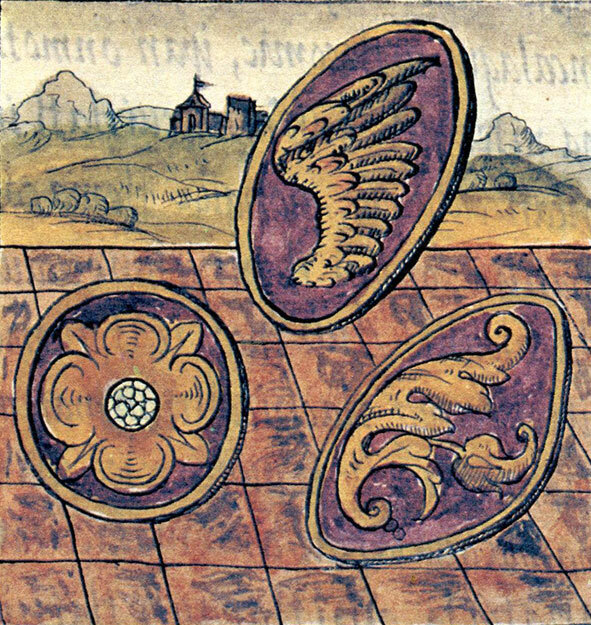 • Pic 10: image from the Florentine Codex (original in the Biblioteca Medicea Laurenziana, Florence) scanned from our own copy of the Club Internacional del Libro 3-volume facsimile edition, Madrid, 1994.